In "The Miracles of Jesus" Superbook whisks the kids off to historical Galilee where Jesus is performing true miracles like healing a cripple, calming a storm on the sea and banishing demons from a possessed man. CBN's Superbook team is made up of Emmy-winning artists and storytellers, whose credits include Mulan, The Lion King, and Beauty and the Beast. Together they are collaborating to completely reimagine the classic Superbook series using the latest 3D CGI technology. The new Superbook honors the life-changing legacy of the classic series and introduces the stories of the Bible to a new generation. Superbook: Miracles Of Jesus DVD by ; was published by Charisma House in February 2016 and is our 2271st best seller. 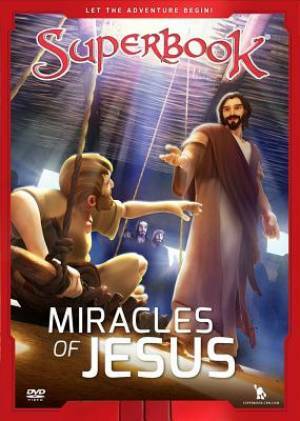 The ISBN for Superbook: Miracles Of Jesus DVD is 9781943541089. Be the first to review Superbook: Miracles Of Jesus DVD! Got a question? No problem! Just click here to ask us about Superbook: Miracles Of Jesus DVD.